What is Veranda Lattice made of? 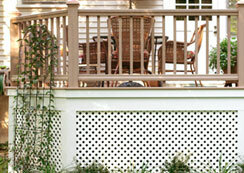 Veranda Lattice is made of plastic which is injection molded with a wood grain pattern on both sides. What colors and styles does Veranda Lattice come in? It is available in 4’ x 8’ Garden and Privacy styles in White, Almond, Brownstone, Wood Tone, Woodland Green, Cedar, Redwood, Brazilian Walnut and Nantucket Gray. A 2’ x 8’ Garden style is also available in white. Will Veranda Lattice rot, splinter or decay like wood? No. When installed according to installation instructions and under normal use, it will not peel, pit, rot, blister, warp, crack, corrode or be consumed by insects. Can Veranda lattice be painted? Painting Veranda lattice is not recommended as most paints will not adhere to the surface well and will rapidly begin to peel. Do I need special tools to install Veranda Lattice? Conventional tools can be used with Veranda for cutting, drilling, and fastening. For your safety remember to wear protective clothing and safety glasses. What type of fastener is recommended? Use #8 ss sheet metal screws to maintain the beauty of your project. Does Veranda Lattice require gapping? Yes. Like all plastic building materials, Veranda Lattice will expand and contract with temperature changes. A ¼” gap is required on all sides of the panel to allow for thermal movement. Refer to the installation instructions for more information. What can I do if my lattice bows? Loosen attaching screws and ensure enough space is allowed for expansion and contraction. Can Veranda lattice be installed lying flat? Veranda lattice is not recommended for applications in which it will lie flat such as the overhead panels on an arbor or pergola. It should be hung upright and attached to a self-supporting structure or frame. Refer to the installation instructions for more information. How do I clean Veranda Lattice? Periodic rinsing with a garden hose is typically all that’s required to remove surface dirt, pollen and debris. For ground-in dirt, clean with a mild detergent and rinse thoroughly.